Personal safety is always a big concern for parents and students as they head back to school. Especially for college kids who will be walking around campus at all hours of the day and night, parents want to know they’re safe. The Urban Crew iSafe backpack comes with a built in alarm that gives some extra peace of mind to students and their parents. The alarm is completely concealed inside one shoulder strap of the iSafe bag, but is easily accessed in seconds by lifting a velcro scrap and tugging on a pull cord. 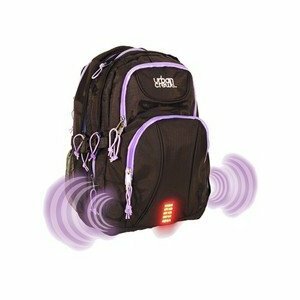 This sets off an audible alarm and also sets LEDs on the backpack blinking red. It is loud! The speakers are set to aim away from the person wearing the backpack, so it won’t hurt your ears, but it’s absolutely going to get the attention of anyone nearby. In terms of activation, it’s simple enough for a child to use, the catch being that you want a child to know it’s only for use in an emergency. My youngest is only eight and she easily set off the alarm and replaced the little pin to shut it down. I had wondered if the Velcro would be hard to manage. If you’re in a panic and need help, can you think clearly enough to lift that little flap and pull the pin? It’s secure enough that it won’t just randomly come undone, but if you grab at that shoulder strap without any particular aim, you can yank the pin out even without lifting the flap. It seems that this is much more likely what would happen if you were threatened or grabbed, and it makes sense that you don’t have to have a huge amount of focus to make it work. The alarm and two 9 volt batteries add about half a pound to the weight of the backpack, which fits laptops with up to 15.6″ screens and features seven different pockets for holding everything your student needs. It also has two side mesh pockets for drinks. Even without the alarm, this is a durable, functional backpack that is going to make it through the whole school year in one piece. I was given the Urban Crew ($99.98) which is a new addition to the iSafe product line, and although it’s a perfectly comfortable fit for an adult, it’s a bit large for younger kids, so you’ll want a different style for them. The price is higher than most other backpacks, but remember, you’re getting a backpack and a personal safety device in one. The full line of bags from iSafe includes smaller styles for kids, messenger bags and sling backpacks, so no matter what you prefer, there’s an iSafe bag designed for you.